So I wasn’t kidding yesterday when I said that I have a newfound love for artificial flowers. 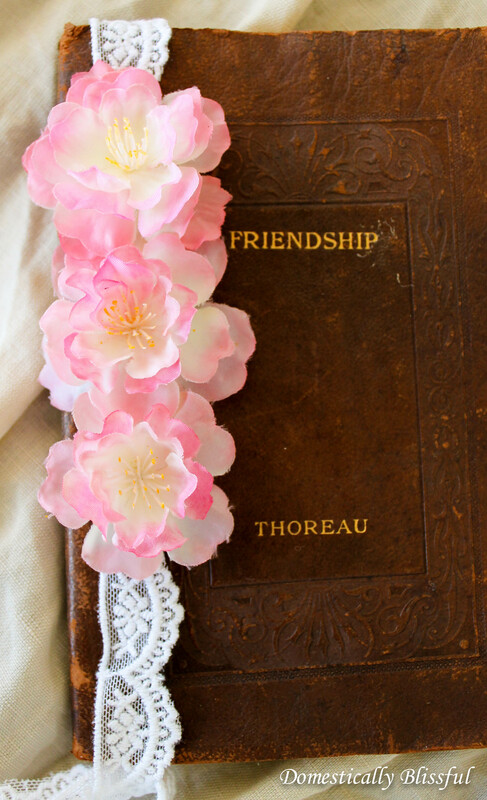 So I’m sorry – but not really – that I am sharing two DIY crafts in a row that showcase artificial flowers. 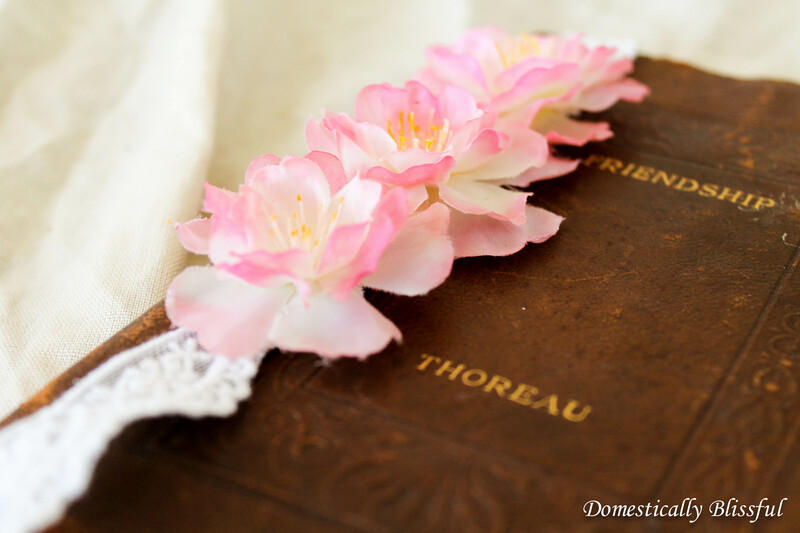 Plus, I figured it would be completely rude of me not to share this super simple project especially when it’s a tutorial for not 1, not 2, but 3 types of Cherry Blossom Bookmarks. Do you recognize these little flowers? They are the same cherry blossoms that I used for my DIY Stemmed Cherry Blossoms. I had a few leftover and I couldn’t just throw them away, so I found a new use for them! I know some people might not understand the need for multiple bookmarks, but if you are a real book lover you are probably reading more than one book at a time – unless of course you are binge reading through a series… I recently binge read a 3 book series in less than a week – and could have used a bookmark or two – and while my husband isn’t a huge fan of my binge reading my brain sure enjoyed it! 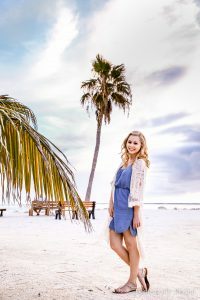 The real reason I am showing you how to make three different cherry blossom bookmarks is because I couldn’t just settle on one – I love all three and I hope you will too! First, cut the cherry blossoms off of the stems, cutting as close as you can to the flower. If the petals are loose and you are worried they might not stay together just add a little hot glue to the back to keep them in place. Next, choose which type of Cherry Blossom Bookmark you would like to create. 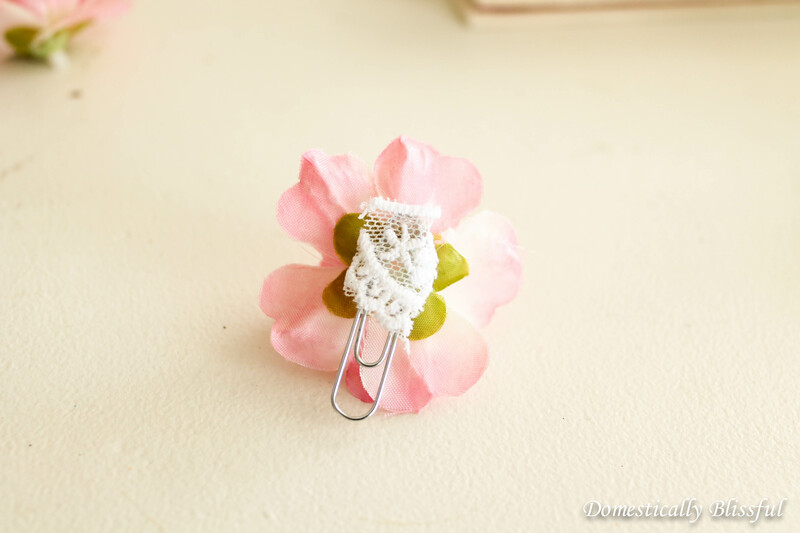 First, take a small scrap piece of lace and glue it to the top/back of the paperclip, then glue the back of the flower to the front/top of the paperclip and to the lace. Let dry and your done! 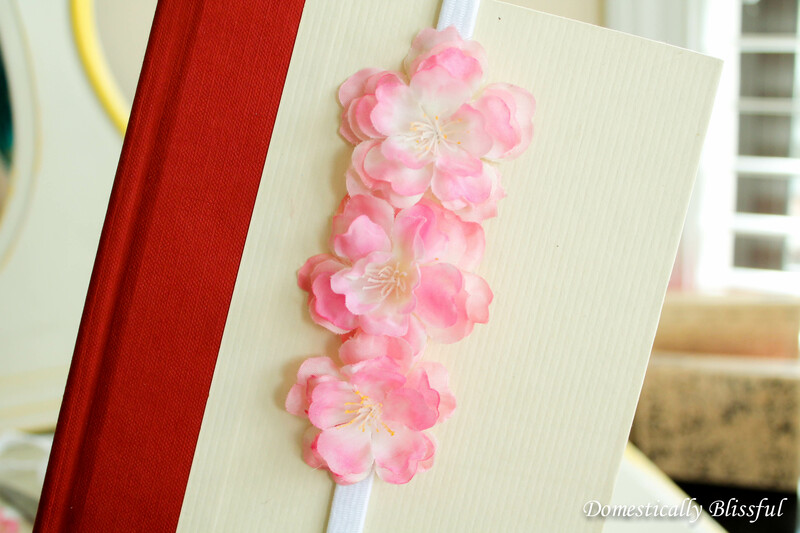 This one is pretty simple, just glue the cherry blossoms to the hairband – you can rotate the hairband bookmark on the book so that the flowers appear on the bottom, top, or middle of the book depending on what you prefer. First, cut a long piece of lace. I used my Pride and Prejudice book for measurement – which is an average size book – and made it over twice as long as the book. 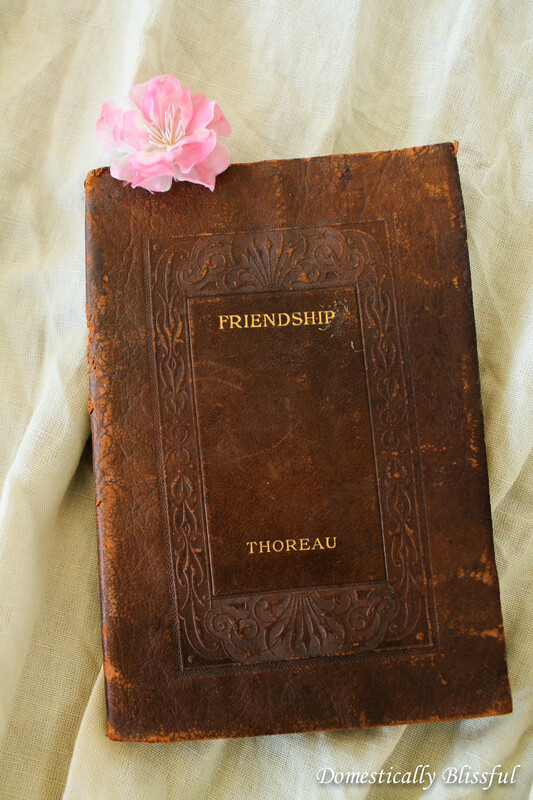 The reason I did this was so that I could run the lace around the book and tie the loose ends together. 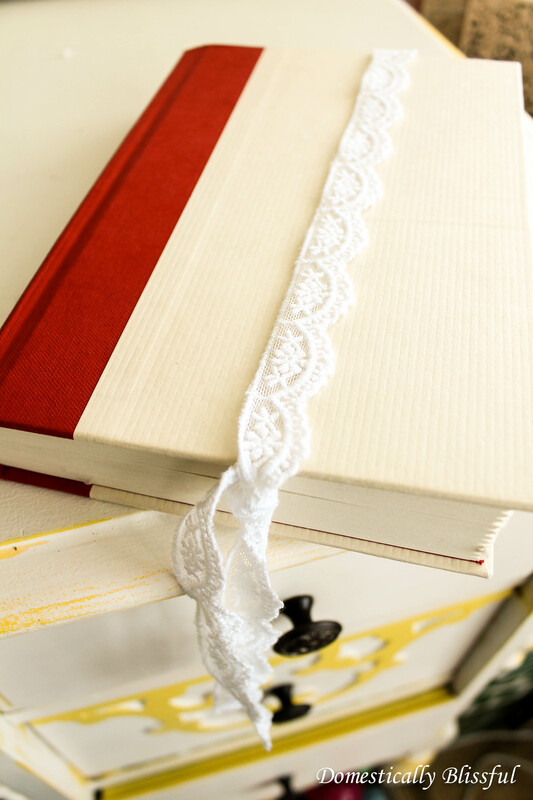 Next, wrap your lace around your book book and secure it at the bottom and glue the flowers to the lace. 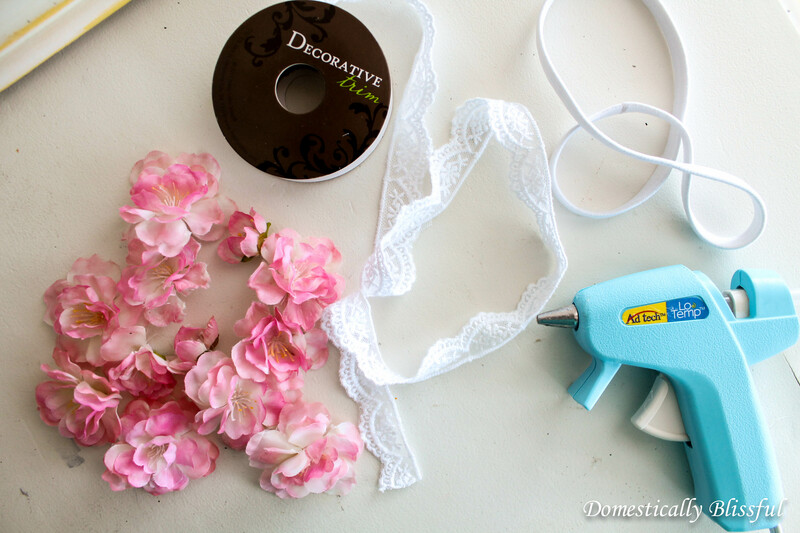 By doing this you will ensure that your flowers are placed correctly on the lace. 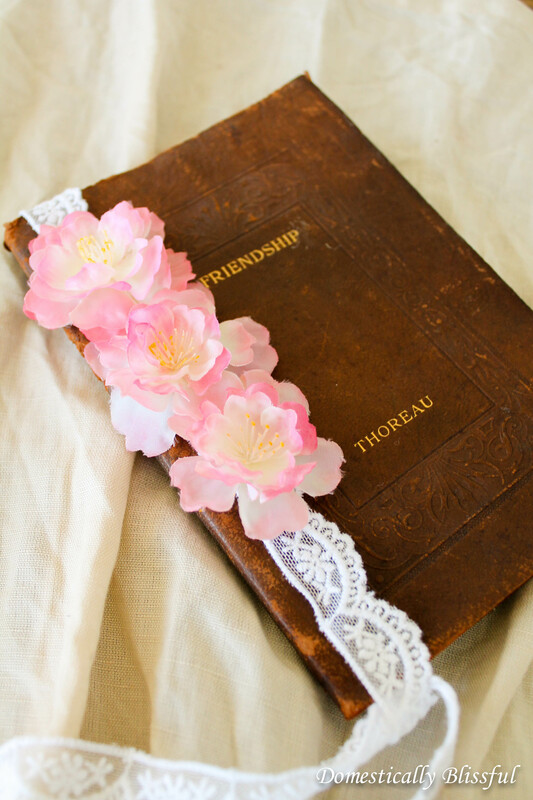 Also, you might want to put something between the lace and the book when you glue the flowers on so that if any glue seeps through the lace it won’t cause any problems to your book. Wasn’t that simple? Don’t worry I’ll give you a few weeks – maybe… – before I add another diy project using artificial flowers. If you missed the other two projects using artificial flowers you can check them out here: DIY Stemmed Cherry Blossoms and Spring Flower Wreath. Beautiful! The hair band one is my favorite.